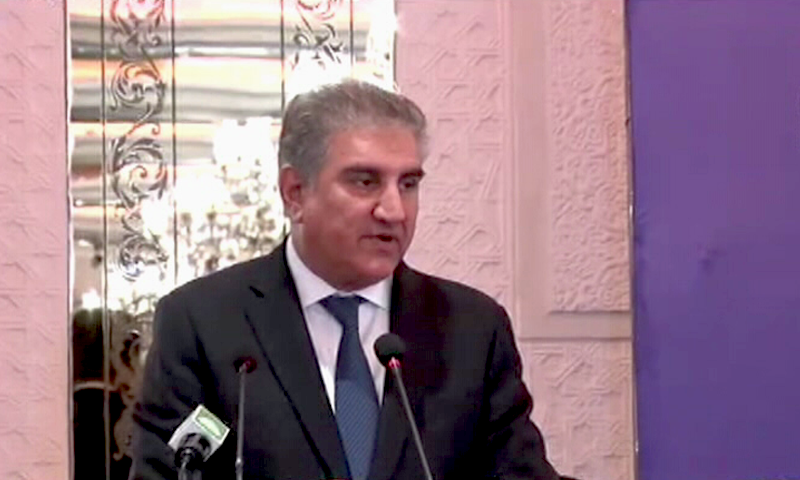 While addressing a National Conference on Strategic Stability in South Asia in Islamabad, Qureshi said Pakistan needs a "willing and constructive partner to tackle the myriad daunting challenges" that the region is facing. "A peaceful neighbourhood is the sine qua non [an essential condition] to build prosperous societies," he added. The foreign minister began his address by noting that recent events were a reminder of the "heavy responsibility" that both Pakistan and India have to bear in working towards addressing the "underlying challenges" to strategic stability in the region. The two also need to commit to a peaceful environment that is conducive to the socio-economic development and welfare of the people. 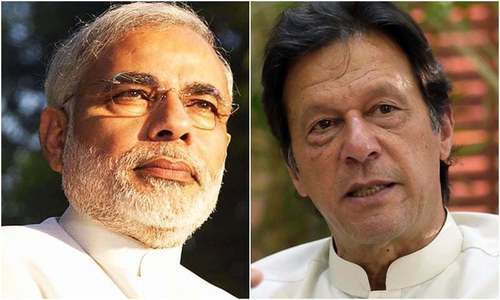 Relations between Pakistan and India reached a crisis point in February after a suicide bombing in occupied Kashmir's Pulwama killed more than 40 Indian paramilitary personnel in Kashmir. India had immediately hurled allegations of Pakistan's involvement, whereas Islamabad strongly rejected the claim and asked for "actionable evidence". Qureshi today said that the South Asian security environment was in a "state of flux". He said that India's "massive acquisition of conventional arms with offensive doctrines" as well as the expansion of strategic assets were developments which had "serious security implications for Pakistan". Qureshi said that the recent Anti-Satellite (ASAT) test highlighted Pakistan's concerns on the "military spin-offs" of high technology trade with India. He said that the country-specific exemption by the Nuclear Suppliers Group (NSG) also had negative implications for strategic stability of the region. The foreign minister added that the introduction of new destabilising weapon systems such as the S-400 anti ballistic missile system could further "accentuate" challenges to strategic stability. "They can encourage misadventure by an adversary under a false sense of security against a counter-attack," he said. He noted that the recent "belligerence" displayed against Pakistan as well as the "assumption that Pakistan could be subject to punitive strikes, at will, is a clear manifestation of threats to stability in the region." Qureshi said that Pakistan was a "peace-loving country," committed to peaceful and normal relations in the neighbourhood. However, he added that they were "equally determined to frustrate any attempt to create a so-called "new normal"." Qureshi said that policymakers had seen that the strategic stability of South Asia has been impacted not only by regional developments, but also by the approach of the international community, particularly that of major powers towards the region. "We hope that key players will recognise the need for an objective and even-handed approach, which is not tainted by considerations of geo-political dominance and defining new regional security paradigms," the foreign minister said. The foreign minister called on outside parties to be "mindful" of their responsibility in terms of arms supplies to the region in pursuit of their geo-political strategies. He said that the designation of states as "net security providers" and bestowing a sense of entitlement on them to pursue capabilities beyond their national security requirments was a "dangerous proposition". Qureshi said that such notions violated the principles of equal and undiminished security for all that were adopted by the United Nations General Assembly. He said Pakistan's conduct as a nuclear-armed state would continue to be defined by restraint and responsibility. "As we seek to ensure our national security, credible minimum deterrence remains our guiding principle," he said, adding: "We are opposed to a nuclear or conventional arms race in the region." As per the foreign minister, Pakistan had demonstrated its commitment to peace and stability by putting forward a proposal for a Strategic Restraint Regime (SRR) — premised on three interlocking elements of conflict resolution: nuclear and missile restraint and conventional balance. He said the proposal remains on the table and if pursued could lay the foundation for a lasting peace and stability in the region. The foreign minister noted that the Kashmir dispute has remained unresolved for over half a century and said that conflict resolution was the key to any successful strategic stability arrangement in the region. 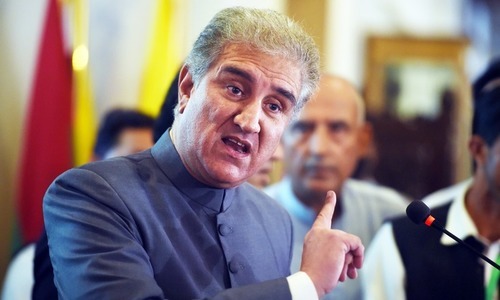 "It lies at the heart of every crisis between Pakistan and India, including the events in February," Qureshi said, referring to the Kashmir dispute. He said that the uncertainty underscores the "urgency" of finding a peaceful solution to the Kashmir issue. 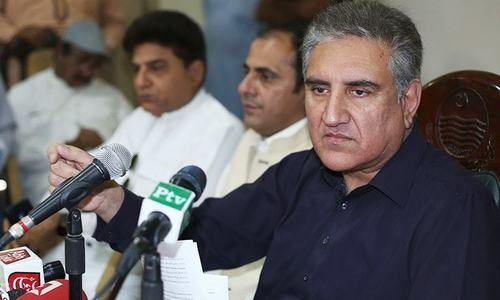 Qureshi said that India's continued violation of human rights in Indian occupied Kashmir as well the denial of the right to self-determination of the Kashmiris had led to frustration among Kashmiri youth. "As a result, the freedom struggle in the valley has gained tremendous momentum and the plight of Kashmiris has caught the world’s attention," he said, adding: "What we are witnessing today in Kashmir is the backlash being faced by India due to its atrocities inflicted on Kashmiris." The foreign minister said that at the last minute, India had postponed a meeting on the Kartarpur corridor that was scheduled for April 2. He said that the meeting had been postponed without seeking Pakistan's views and came after a "productive" technical meeting on Mar 14. "Our neighbour needs to understand that the only way forward is dialogue and not its suspension," he said. 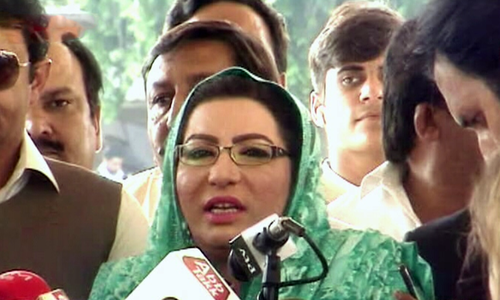 The minister noted that with the inauguration of the Kartarpur corridor, the current Pakistani government has shown that it was ready to take concrete steps to ease tensions and shown its shown it commitment to work towards friendly relations with India. Qureshi concluded his remarks by reiterating that Pakistan was committed to improving bilateral relations with all neighbours and to building a peaceful and prosperous region. India not interested in moving forward. If Pakistan wants talks it can beg and sit on a lower platform as a weaker party ready to give up a lot during negotiations if required. Let me tell you this attitude would help India behaving fairly like an elder brother and help Pakistan in its very difficult times. The only way forward is keep the parts of kashmir each country has and move forward cause no one will let their part of kashmir let ho no matter what.. Lets see what he says tomorrow. One Day weather is hot and next day it is cold. True..but talks at gun point bears no fruits. This guy speaks a lot. No dialogues till modi is in power. I recently saw an interview where someone asked Mr. Modi about how he will treat pakistan during his tenure. His reply was we will see Pakistan on another side of a tall wall (No relations at all). Sir no words on IMF Chief Visit to pakistan and the reform plan? Why not mind our oen business instead ? What will dialogue achieve ? Quereshi Saab pls start doing good for Pak masses rather thinking about India whole day, your first job is to work for betterment of Pakistanis not to create havoc to divert the attention. Wait for peace talks till congress comes to power. Why u want any relation with Modiji when according to u he will take some agressives steps against pakistan between 16-20 april. By the way India’s gdp is growing at 7.5%. Once congress is wiped off , it will grown above 8%. So u better take care of ur country and not about region. So can we count on Pakistan now? No other misadventure will take place? Good morning Sir, say something new like acknowledging that every long term problem has two sides to it and accepting your negative role in it! Does the PM,FM and foreign minister have nothing to do except giving statements on India and Israel daily?? It seems like they are clueless where the Pakistani economy is heading. Difficult to assess which one is a Googly and which one is not? We will move forward without dialogue. We don't need it. As far as India concerns, Modi had currently said, "let Pakistan die its own death", and India shall continue to move on the path of development and prosperity. The diversion wont work. PTI needs to answer on economic GDP growth reduction and series of U-turn. Can’t fool masses more. So now he claims only one aircraft fell on AJK.Where did the second one fall?Also why no details of second pilot has been released yet? Dg ISPR nd Imran had said 2 pilots landed in Pakistan. Narrative is changing daily. What's up with him? Dude's been changing stances like Hitler's directives. Wrong, there is plenty of scope for a few more ROUNDS. Complain all you want, but India will not limit her progress just because pakistan has an inferiority complex! But, who is going to be the dialogue writer? How about listening to your own advise? If you want to talk, then don't provoke us with your proxies.... India will not show the other cheek. We are not afraid of escalation. 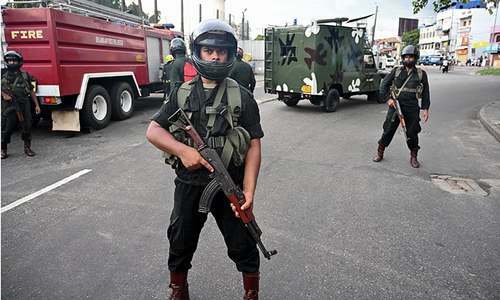 What cost is pakistan ready to bear? He is right. Nevertheless, a dialogue could only be effected or take place between a minimum of two parties. Can you clap with one hand? Yes, please stop hurting us. Pakistan's entire foreign policy is surrounded around India. It makes it look very weak. There are 194 other countries on this planet. Pakistan's one-sided gestures will never influence on India to signal similar gestures unless unless Pakistan rises up to the same level of economic and military might. Therefore, it is futile to extend hands of friendship to India every now and then, and better to rebuke India with same language. Meanwhile, it is necessary for Pakistan to build its economy and military strengthen at the pace and level, as India does, so that Pakistan can exist with honor and peace in the region. I absolutely agree with Shah Mehmood Qureshi. Dialogue is the only way to resolve all internal and external issues of a country. War never resolves anything. Neighbors should have cordial relationship so that we can resolve commoners issues rather then spending billions on other activities. Lets coexist and promote trade. Lets spread love rather then hate (A message of peace from a commoner). And why are you repeating it everyday. India is least interested in Pakistan or relationship with it. Don't understand why Pakistan is demanding relationship with India! Too much India India happenning in Pakistan. Concentrate on economy rather than deflecting attention. India should have dialogue with China for regional stability. @Sha b, Very true! Talks at gun point or talks with gun in the pocket bears no fruit! The biggest theory is given by the gentleman. Pakistan's Foreign Minister is right. Dialogue is the only and only way to move forward towards complete normalization. India is moving forward @7.5% per annum, thanks for your concern Mr. Minister. no, not really sir. actionable evidence is the only way to move forward. After every attack on India which seems to have originated in Pakistan, the issue is always stuck at "actionable evidence" stage. So unless that thing happens, there can be no forward movement from either side. What if one party is only interested in moving backwards? You people wants talks on Kashmir and there will be only talks... nothing else. India has moved forward than anticipated, its up to Pakistan to move forward. Ok. Thanks for the information! Must we always move forward, we are happy where we are. Why none of the politicians in Pakistan say Pakistan and India need to talk about trade, technology, economy and poverty? Why don't they push for bilateral talks on improving trade and economy? So the reality has set in Islamabad that Modi will be the next PM of India . @Ashraf, Trade bro trade that will be achieved by dialogue. The FM knows the forthcoming color of FATF..
@Monsieur , he knows Modi will win and article 35A and 370 will be gone. Let the history prove if the only way with India is thru dialogue or otherwise. @Sab Se Pehle Pakistan, We repeat the same thing over and over again. There is already an existing agreement signed by ZA Bhutto and Indira Gandhi in 1971 that all bilateral issues will be resolved by the two countries without any third party intervention. India then withdrew its complaint that she had filed before the United Nations in 1949. Every single day IK and this guy keep making loud statements, often incendiary statements. Nope. Might is right in this case. If words were gold coins Pakistan would be wealthy. @Smack the zak, Kashmiris will decide who they will joun, not India. The current scenario in IOK is for all to see, in contrast see Azad kashmir. @ankit, He will say same thing tomorrow. Come back everyday to this educational forum. Only way for pakistan to move forward is through dialogue. India will move forward anyway. Sorry sir, you live with your Kashmir issue, we are capable to tackle everything everywhere. 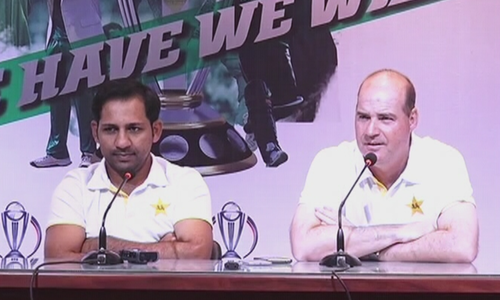 Huge trust deficit, we are not able to make ourselves believe that you can be believed.
" The minister noted that with the inauguration of the Kartarpur corridor, the current Pakistani government has shown that it was ready to take concrete steps to ease tensions and shown its shown it commitment to work towards friendly relations with India' Earlier the FM termed Kartarpur as a googlie.whats changed? Why this minister thinks about India every now and then? There is nothing to talk. You can try the same way you have tried for last seventy years. That benefits India. The government need to stop dialogue policy with such an ignorant neighbor, and as the public is bored listening to it all the time. Move forward and forget about such a neighbor. It's a waste of time. Sir , we will be 10 times your GDP in next 8 years . We don’t want to hear any thing which doesn’t make sense. And the only way for Pakistan to move forward is to expand tax net. This monologue about dialogue is rather repitetive. @Tamanna, Slight correction. Not ignorant, disinterested. FM should start thinking about economic Woes instead of blabbering and wasting his time. true..but Pakistan keeps using a strategic tool, JeM, LeT etc. Have some courage & pride please ! Wait for Modi to come back, he will talk to Pakistan in the language it understands. Agreed!! But thats Pakistan version. Sensible and meaningful statements but it is pointless to tell india to think rationally. It is apparent indians are trying to become israel of subcontinent here with the help of usa and western countries. But unfortunately, they have not divided arab countries but Pakistan and China here to deal with. Religion, future of economy nd control are both motivators of western powers to destabilize this region. Target: one belt one road. Beneficiary: USA and company. Losers: those playing into the hands of beneficiaries. India needs to see reason now before its too late to turn events back. Attempt to bury IMF news. Dialogue possible only when both sides want it . Dialogue dialogue dialogue-this word has lost its meaning . In the morning, positive statement, end of day, negative statement. @Vikas, :Do you know last December one Pakistani guy even approached Indian court to direct the government to issue medical visa to him. Can anybody believe this? This will not solve the Kashmir issue, both sides of the table must sit and talk. Not blaming India for lack of peace process, Pakistan has his fair share of blame too.